Last fall, after Gov. Bev E. Perdue said she'd go to prison to keep 20 child rapists, murderers and assorted violent inmates sentenced to life in prison from being released by the courts on Oct. 29, her approval ratings, which were among the lowest in the nation among governors, headed north for the first time in months. Now it appears that Perdue and her staff pulled a fast one on the citizens of the state. E-mails from the period obtained by the state's news organizations increasingly show what I've been reporting since December. The only folks with plans to release those inmates were those who worked directly for Perdue. That's right. Perdue's staff members, appointed by her, and their underlings, made plans to release the inmates unnecessarily, prematurely and for no apparent legal reason on Oct. 29. Then Perdue played the heroine by stepping in to stop them. The courts had ordered their release, she claimed at the time, but no court had. It was actually Perdue's office that informed the media of their supposedly impending release, with a press release that included unflattering mug shots of the inmates and descriptions of their crimes. Reporters bought it hook, line and sinker. "Letting them out is not going to be the answer that I am going to be able to live with," Perdue said in the Raleigh News & Observer. "In other words, if I go to jail, are you going to visit me? Somebody said they were going to bring me cookies." That's ironic, because e-mails obtained by the News & Observer through an information request now show that at the time, Perdue's staff was prepping 19 inmates for release who had not approached the courts about the issue. The governor's office simply dug up inmates with convictions similar to an inmate named Bobby Bowden, who was convicted of murdering two Fayetteville men in 1975, and paraded them before the media. Perdue's office dredged up the additional inmates after a court ruled Oct. 9 that Bowden was eligible for a life sentence, and that a life sentence equaled 80 years, according to laws regarding the period. Other laws further cut life sentences for those who committed their crimes during a period in the 1970s. How to calculate the years Bowden had left in prison was left open to interpretation by the courts. The state Supreme Court will take up the issue of how to count credits for sentences issued at the time this week, which means it is still an open question. Back in October, the story was a huge one, and since the inmates remain in prison, most people probably assume that the governor successfully blocked their release. Few realize that it was the governor herself and her appointed underlings who came up with the contrived Oct. 29 release date, then let it pass. Perdue's charade was so convincing, it may actually help some of the inmates go free. Attorneys for the inmates have since called on Department of Correction Secretary Alvin Keller to testify in court on the inmates' behalf. Since Keller, who was appointed by Perdue, was prepping them for release, the governor's administration must believe that they should be released, the attorneys have argued. That put Keller in between Perdue and a hard place. In December, Keller testified under oath in a Wayne County courtroom that he had never authorized the inmates' release back in October. (It would have looked bad if Perdue's own staff was caught authorizing the release of violent criminals at the same time she was vowing to block it.) But the e-mails from October obtained by the N&O show Keller and other prison officials preparing inmates for release while Perdue was all over the media promising to fight it. And while it is true that the state, through the attorney general's office, has been fighting to keep those sentenced during that period in the 1970s for violent crimes in prison, there won't be anything Perdue or anyone else can do to stop their release if the state's Supreme Court says they have served their time. All of which makes her a drama queen starring in her own political production. It's a new role for Perdue, who was enough of a fan of parole for violent inmates that her office employed Sally Holloman, a double murderer on work release from state prison, while Perdue was lieutenant governor. Holding the position may have helped Holloman qualify for parole. Holloman killed her second husband by lacing his tea and hospital IV with arsenic, and later shot a businessman in the 1980s. She served just 20 years total for both those crimes, a fact that Perdue doesn't seem particularly troubled by. 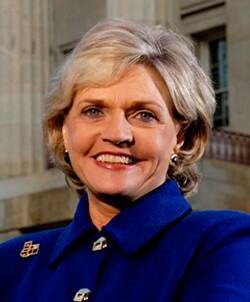 "Sally is working now in the private sector, making good money," Perdue told WTVD in Raleigh. "She is an older woman who I believe is very well supervised. But, I do believe that folks who are on parole, who are monitored and supervised can indeed participate in the community because there's always a set of rules. There's always a set of parameters. So nobody's out there a free agent."